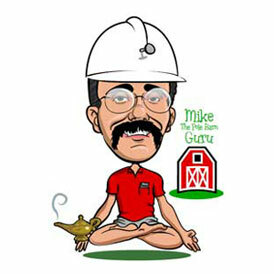 Today the Pole Barn Guru discusses rebuilding on an existing concrete foundation with dry set brackets, unfinished work, and proper engineering. 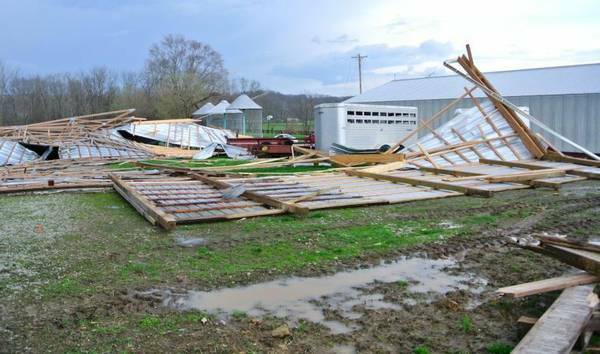 DEAR POLE BARN GURU: I’ve recently torn down an old machine shed that still has very good 8″ wide by 24″ deep cement foundation walls that I’m thinking about using to erect a new pole barn/machine shed. Only about 6″ out of the 24″ of the foundation wall is above ground. Can I erect 4×6 or 6×6 posts to the existing foundation or should I use more of the stick framing techniques? One additional question on this: The previous machine shed had a sole plate on the foundation. Would you normally use a sole plate in a situation like this as well or just attach directly to the concrete? What’s the advantage of using a sole plate? If I were to use a sole plate and anchored it to the foundation, and then put the posts on top of the sole pate, how would you recommend attach them to the sole plate? DEAR MICHAEL: Regardless of design solution chosen, it would prudent to have your existing foundation reviewed by a competent local engineer for adequacy. In many areas frost depths are deeper than your foundation, rendering it unable to be reused. 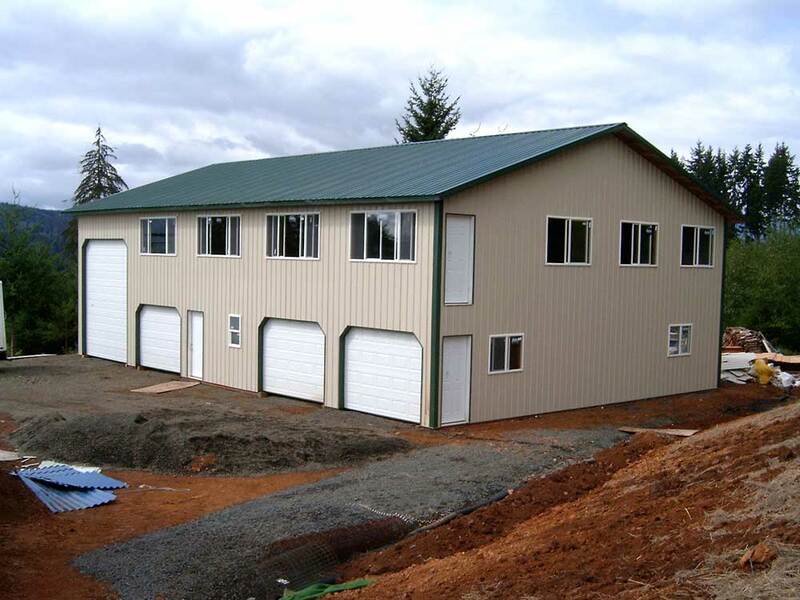 Provided your concrete has sufficient depth and strength, a post frame building can easily be mounted to it using dry set anchors (https://www.hansenpolebuildings.com/2014/12/dry-set-column-anchors/). Bracket manufacturer shows anchors mounted directly to concrete walls and I would imagine this achieves best possible connection without creation of additional hinge points due to sill plate thickness. Sill plate still in place upon top of existing concrete wall, then I would recommend it being cut away where brackets will be located. 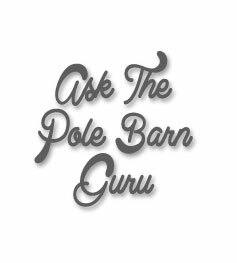 DEAR POLE BARN GURU: I had contacted you before regarding a kit but decided I didn’t want to get into a project that big. I contracted with a local builder from Idaho Falls, Idaho to build my building in Afton, Wyoming. He seems to have disappeared after setting the posts and framing in the wall girts. Since he builds very similar to your kits I thought I might inquire to see if you could sell me a partial kit. 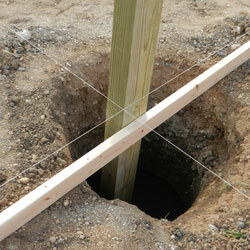 What I have is 6×6 posts on 12 foot centers and as I already said, they are framed in with 2×6 girts. DEAR JOHN: I hate it when a builder pulls things like this it just makes our entire industry look bad. We’ll need specifics of dimensions and features to price balance of your building, as well as what materials you actually have delivered. We have distribution agreements with vendors all across country in order to maximize possible providers and minimize costs of shipping. 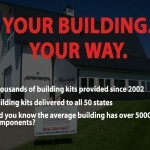 Your Hansen Pole Buildings’ Designer will be reaching out to you shortly. DEAR POLE BARN GURU: For the post on top of a foundation wall would you recommend 4″ x 6″ or 6″ x 6″ post and would they need to be treated? DEAR MICHAEL: Second part of your question gets answered first, it would only need to be pressure preservative treated if wood was in contact with concrete. As most commonly available timber sizes are pressure preservative treated, you might very well find treated timbers to be both more readily available and more cost affordable. As far as size of column – this should be determined by an engineer hired to design your building (or engineered plans provided by your post frame building kit provider). Post size will be influenced by heights of both walls and roof, design wind speeds and wind exposure, snow loads and many other variables. 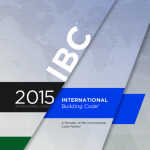 Please do not just take advice from some layperson when it comes to your building’s structural design, rely upon a registered design professional. 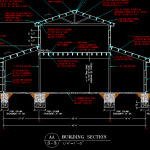 This entry was posted in Pole Barn Design, Pole Barn Structure, Footings, Professional Engineer and tagged foundation, engineering, footings, dry set brackets, unfinished work on October 8, 2018 by admin. 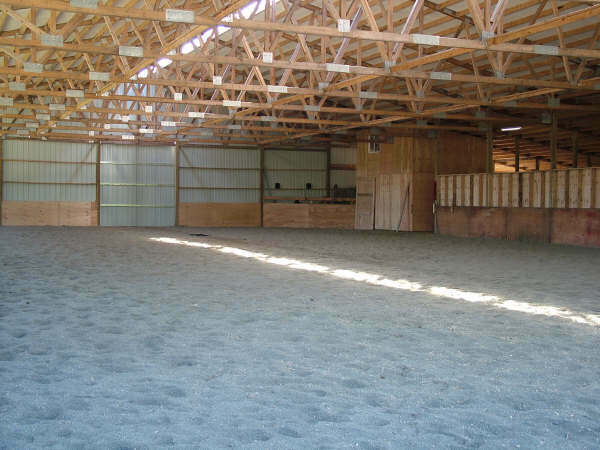 In six years and nearly 1500 articles written it is hard for me to believe I have actually overlooked the topic of a lean-to being added to a pole barn! What exactly is a lean-to anyway? According to the sum of all human knowledge (www.Wikipedia.com) a lean-to is a type of simple structure originally added to an existing building with the rafters “leaning” against another wall. 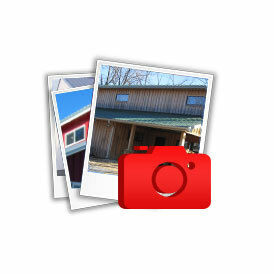 Wikipedia may consider a lean-to a simple structure, however there is far more involved than may meet the eye. 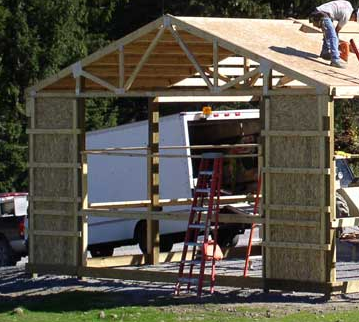 Before diving deep into adding a lean-to to an existing pole barn (post frame building) a competent Registered Design Professional (RDP – engineer or architect) should be engaged to determine the adequacy of the existing structure to support the lean-to. Failure to do so can result in catastrophic failures – causing injury or death. Before I ramble on further, this article is not an engineering recommendation and should not be considered as such. Please utilize only services which can provide RDP sealed drawings for your project. Why bother? It is just a simple roof! The footings beneath the existing wall columns need to be verified for adequate diameter to support the weight of the existing building, the lean-to and the weight of imposed climactic loads such as snow. Even if the newly proposed lean-to is just a roof, the existing wall columns need to be adequately sized to support a greater surface of roof for horizontally acting wind forces. If the lean-to is enclosed on the low eave side, the new lean-to roof outside columns must now carry the wind load against the top half of the new wall plus the entire roof! A change in roof pitch between the existing building and the lean-to, or the lean-to high side being lower than the existing structure can result in snow drifting and snow slide off loads which need to be carefully considered. If the existing building has trusses or rafters supported by a truss carrier (header between the trusses) it is unlikely this carrier will be adequate to support rafters being attached to it. Come back next Tuesday for …the rest of the story on adding a lean-to onto an existing pole building. 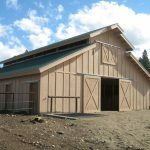 This entry was posted in Pole Barn Questions, Pole Barn Design, Pole Barn Planning, Pole Barn Structure, Professional Engineer, Sheds and tagged professional engineer, RDP, footings, pole building lean-to on June 22, 2018 by admin. DEAR THOMAS: Quite comfortably and affordably 80 foot. I’ve done up to 100 foot clearspans in this loading combination however many truss plants do not have the capability to fabricate or ship trusses 100′ long in one piece. DEAR ED: There are some “rules” for notching wood members, however they apply to floor joists and stud walls in conventional light-frame construction, not to columns in post-frame construction. 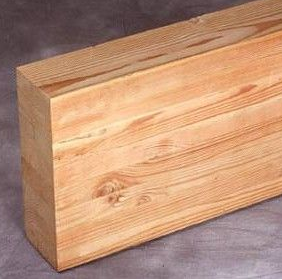 The limitations for notches in columns would depend upon the placement of the notch and the ability of the remaining timber to carry the imposed loads. Columns are subject to forces of bending and compression. In compression columns are very strong and rarely is over 10% of the strength of the column needed to carry the downward loads. As long as the notch is done to insure a tight fit and the connection between the column and the member fitting into the notch is done properly the downward loads will be carried through the column as if it was never notched at all. 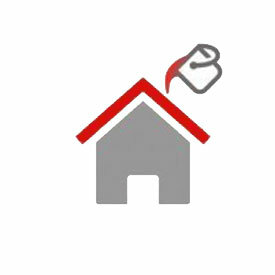 In bending the maximum moment (bending force) is going to occur somewhere midway between the supported ends (or in your case between the ground and the loft floor), very little bending force occurs at or near the ends. The remaining column at the notch must be adequate to resist shear forces, however the lateral restraint provided by the rigid floor makes these manageable. DEAR TIM: In the event you have an inadequately prepared site, then having a continuous footing and foundation below the doors (and extending past the columns on each side of the doors) might be a good investment. Such a system would need to also be deep enough to be below the frost line, which could make it cost prohibitive. Sites which have been properly prepared rarely have issues with frost heave. You will want to read the series of articles which begins here: https://www.hansenpolebuildings.com/2011/10/pole-building-structure-what-causes-frost-heaves/. This entry was posted in Uncategorized and tagged footings, Clear Span, Truss length, Notching posts, Loft support, ohd on February 5, 2018 by admin. DEAR PHILLIP: It will depend upon what you are using for door jambs as well as if you are using a track cover (steel trim). Having a track cover above the sliding door track board is the only way to keep massive amounts of weather from entering your building above the door, so probably a good investment. If your jambs stick out from the framing an inch or so outside of the siding, then you should be able to use a 54-56 inch width. Height should be equal to a minimum of the height of the hole (assuming again the use of a track cover) and can be greater. DEAR TERRANCE: How much would it cost to buy a new car? It depends upon if the car is an economy subcompact or a limo. Features, degree of quality and dimensions are all going to factor highly into the budget. The antique wood barn boards can run anywhere from seven to 20 or more dollars per square foot of wall area – just for the siding! 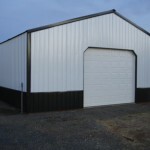 A 2400 square foot building with a 14 foot eave height could easily have $50 to 60 thousand dollars in barn board siding, many times more than the investment into the building shell itself. Most of our clients opt to go with the look of barn boards using 1×4 cedar battons every 16 inches over rough sawn T1-11. This route saves tens of thousands in materials alone. DEAR CHRIS: The thickness of the concrete footings as well as diameter of the concrete collar (and hole) is calculated by the engineer who sealed your building plans and will be specified on those plans. Your engineer takes into account the soil bearing capacity of the ground at your site, the spacing of the wall columns, design wind speed and exposure, frost depth, roof snow load, roof slope and roofing material, width of the usable attic space and what the space will be used for, as well as use of any uninhabitable spaces outside of the width of the attic bonus room. Ceiling materials as well as any concentrated loads from HVAC, plumbing, etc., also are factored into the equation. If you are not finding this information on your plans, contact the engineer who designed your building and ask him or her. In the event you do not have engineered plans (or no plans at all), you need to hire a Registered Design Professional (RDP – engineer or architect) to correctly calculate this for you. Do not attempt to guess, or do this on your own. Inadequate footing result in buildings which settle and shift – neither of which is a good design solution. This entry was posted in Pole Barn Questions, Pole Building How To Guides, Pole Barn Structure, Pole Building Doors, Concrete, Footings, Alternate Siding, Professional Engineer and tagged engineered plans, sliding door installation instructions, footings, double sliding doors, sliding door trim, Antique barn wood on September 18, 2017 by admin. DEAR ROGER: In a word – YES. Keep in mind, what we do is the structural portion of your building – the exterior shell, any raised wood floors (like over a crawl space) or second and third stories. Any non-load bearing interior walls will be up to you. You will find tremendous savings in the foundation, as well as from the ability to construct it yourself. DEAR BILL: We can provide buildings of any possible dimensions of width, length, height and roof slope. The beauty of the Hansen Pole Buildings’ Instant Pricing™ system is it calculates exactly the materials needed for any size post frame building – you do not have to pay a premium to get dimensions other than what many people consider to be ‘standard’. 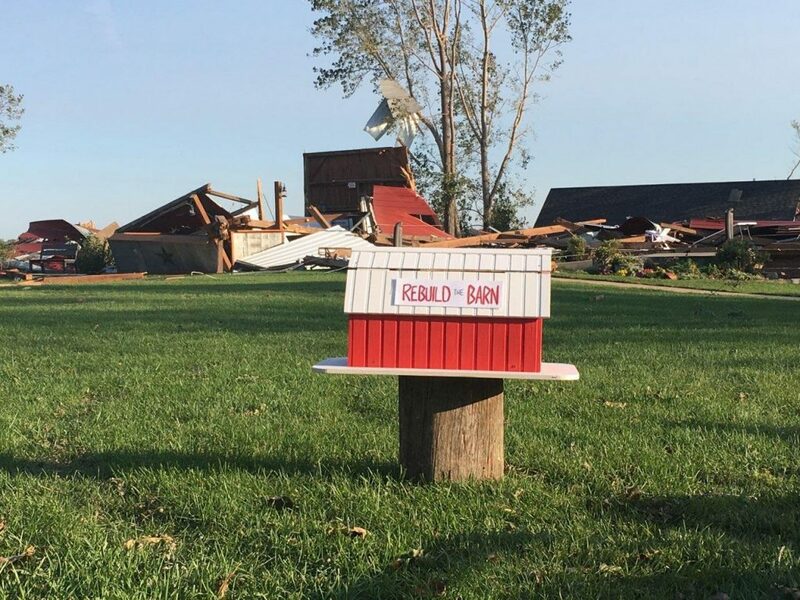 DEAR POLE BARN GURU: Building area has a hill on one side. The man doing my dirt work has leveled the site and is now going to add 2 foot of gravel to get the site up higher and away from the hill and 3feet wider all the way around the building foot print.. Also by raising the site he will be able to provide a trench to move water away from building The site is mostly heavy clay soil .so my question is will I need to get longer poles to get down below frost line of the original grade or from the building grade he created. DEAR LARRY: Provided your excavator is doing proper compaction of the materials he is bringing in, the depth and diameter of the building columns should be able to remain the same as they were indicated on your original engineer sealed plans for the building. Here is detailed information on achieving adequate compaction: https://www.hansenpolebuildings.com/2011/11/soil-compaction-how-to/. 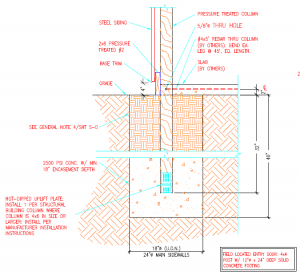 If unsure at all, it would not hurt to order columns two feet longer than normal and auger the holes deeper than shown on your engineered plans by the thickness of the fill. In my humble opinion, your foundation is what everything is built upon, and to not err on the side of caution is leaving the support for your brand new building up to chance. 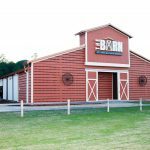 This entry was posted in Pole Barn Design, Pole Barn Planning, Building Drainage, Pole Barn Homes and tagged footings, Home Plans, Custom Sizing, Drainage, site compaction on July 3, 2017 by admin. 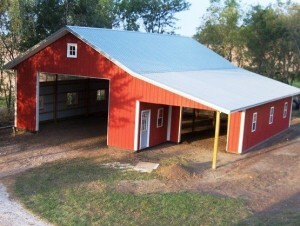 DEAR POLE BARN GURU: I am looking for a bottom guide for a sliding barn door. I was hoping to get a guide with a roller vs. just a roller. I noticed some guides trap the roller in a channel on the bottom of the door. I would like to know if you have that and where to purchase in Lower west Michigan. DEAR GERARD: I have found the very best sliding door guide systems do not use bottom rollers at all. Known as “stay rollers” the bottom rollers tend to be problematic, especially in tough climates or when large animals are present. 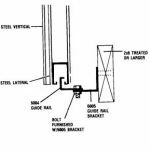 The most secure and effective method utilizes a bottom girt for the door which is most typically a galvanized steel channel 1-1/2” x 3-1/2” (think of a steel stud) with a slot in the 1-1/2” face towards the ground. A galvanized steel “L” is mounted via brackets to the wall in the direction the door slides open. The upward leg of the L engages with the slot in the bottom of the lowest sliding door girt. This design solution provides stability for the bottom of the door, preventing it from coming away from the building, or slapping against the ribs of the steel as it opens. Hansen Pole Buildings does not provide sliding door components other than with the investment into a complete post frame building package. You might try the ProDesk at your local The Home Depot®, as they should be able to order the parts in without you having to pay an onerous amount of freight. DEAR JOHN: One of the beauties of post frame construction is the ability to be able to pour your new building’s concrete slab on grade at any time after the columns are placed in the ground. My personal preference is to at least wait until the roof is on – as it provides greater protection from sudden unexpected rainstorms as well as sun. The best time to pour (in most situations) is after the building shell is fully completed. Premix concrete trucks do seem to have an affinity for running into building columns which are not part of a wall. DEAR RON: Code specifies the depth of foundations (in this case your columns) must be either below the frost line, or to solid bedrock. 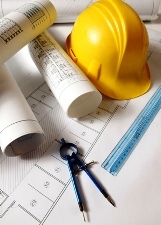 You will want to discuss your particular site challenges with the registered design professional (RDP – architect or engineer) who provides the sealed plans for your building. Our engineers will often solve this anchorage problem by having you drill holes into the bedrock to epoxy in rebar pins which will be embedded into the columns, then backfilling the holes with concrete. To minimize potential frost heave issues, you will want to read my articles on site preparation (use the search bar at the upper right of this page) – as you will want to remove any soils which could contribute to heaving. This entry was posted in Uncategorized, Pole Building Doors, Concrete, Footings and tagged Concrete, footings, bedrock, guide rollers, slab on June 19, 2017 by admin. What Kind of Footings? Beams? and Bi-Folds? DEAR MITCH: The question would be best asked of the engineer who designed your building as there are innumerable factors which are going to influence the size of the footings. These include (but are not limited to) the allowable bearing pressure of the soil at the site; will the building be constrained by a concrete slab on grade; the wind speed and wind exposure; dead loads – actual building weight which will be transferred to each column; will there be a second floor or loft in a portion of the building (like the raised center)? What will be the spacing of the columns? When clients invest in a new Hansen Pole Building, all of these factors are taken in consideration by our proprietary Instant Pricing system and included on the engineer sealed building plans and the supporting calculations. In the event an engineer did not happen to design your building, it would behoove you to hire one to at least properly design the footings for you, if not the entire building. With a 40 psf (pounds per square foot) snow load, both drifting and sliding snow must be accounted for to prevent a catastrophic failure. 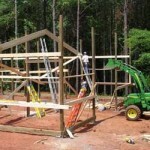 DEAR POLE BARN GURU: I am a high ropes builder and I have a camp that is on a tight budget but needs a new 30′ long balance beam for their high ropes course. DEAR SHAWN: I have a client, whom I built a building for back in the 1990’s, who has become a good friend. He operates a high ropes course just north of Spokane, Washington: https://adventuredynamics.com/. In answer to your question(s), since you are from Indiana, I would recommend contacting Stark Truss as they manufacture glu-laminated beams and columns which should be both affordable and straight. Here is the information on them: https://www.starktruss.com/products/perma-straight/. DEAR MIKE: Post frame buildings make excellent airplane hangars. 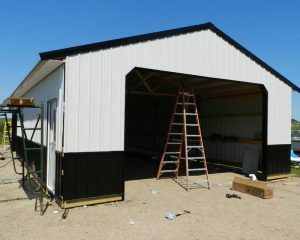 We can customize virtually any building to accommodate a hangar door. 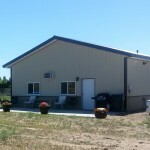 Here is some reading about airplane hangars: https://www.hansenpolebuildings.com/commercial-buildings/airplane-hangars/. We would need to have the specifications of your proposed bi-fold door, in order to properly design the end of your hangar to support the door. See bi-fold door information here: https://www.hansenpolebuildings.com/2015/02/hangar-doors-2/. 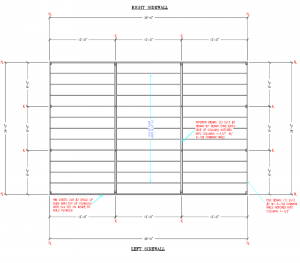 This entry was posted in Pole Barn Design, Pole Barn Planning, Pole Barn Structure, Pole Building Doors, Footings, Rebuilding Structures and tagged footings, Doors, Beams, Bi-Folds, hangar door on April 17, 2017 by admin. What? Sir Isaac Newton pretty much confirmed things do not fall up. Well, this building did not actually “fall” up – it was sucked out of the ground. How would I know this? Look at the ends of the columns which are lying on the ground. There is no concrete attached to the bottom of the columns, nor is any method for preventing uplift even obvious to the more than casual observer. In review of the NFBA (National Frame Building Association) Post-Frame Building Design Manual (January 2015) the issue of column uplift is all but ignored. Beginning with the end of Page 5-37, it is concluded two pages later. Options for preventing uplift are really not addressed. For decades we, if not many other post frame designers and builders, have relied upon the bond strength between concrete and wood in designing column embedment to prevent uplift issues. More can be read about concrete to wood bond strength here: https://www.hansenpolebuildings.com/2013/04/pole-barn-post-in-concrete/. 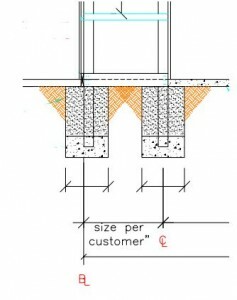 I’ve expounded previously upon the use of nail on truss plates for assisting in uplift construction (https://www.hansenpolebuildings.com/2013/04/truss-plates-for-column-uplift/). 1. Two 2x6x12 inch column uplift protection blocks attached to each side of the base of the column. The column uplift protection blocks must be placed horizontally, attached per Table 5 and comply with Section R317. Table 5 mentioned above happens to be five 16d hot dipped galvanized nails into each block. While I was researching for this article, I happened upon an example for preventing uplift in an all steel building. 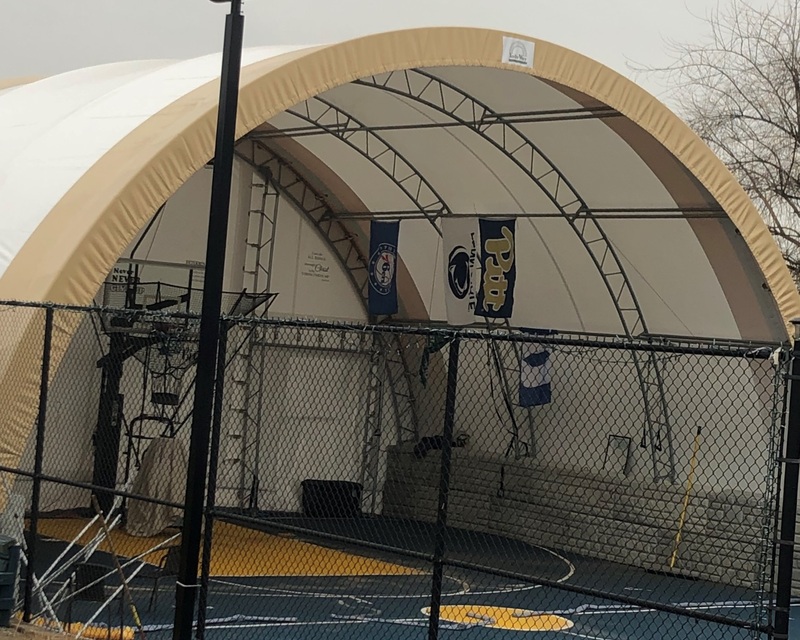 The building in this case was a 60 foot span and steel frames every 25 feet. In this case the design footing was eight feet square by 3’8” in depth!! The all steel building is going to have footings which take nearly nine yards of concrete per bearing location!! This is near the capacity of a pre-mix concrete truck, per one end of each frame! Getting back to the post frame building design solution, our engineers have determined reliance upon the concrete to wood bond strength only is not quite as conservative as they might like. The solution – Hansen Pole Buildings, LLC engineered post frame buildings now have added the nail on uplift plate tot the roof supporting columns to tie into the concrete column encasement. The investment is minimal and it does afford some added insurance of success in preventing uplift. This entry was posted in Pole Barn Design, Pole Barn Structure, Columns and tagged Concrete, footings, Uplift, uplift protection, rebar tie-ins on March 7, 2017 by admin. Most familiar, as well as most available is the Sakrete® general purpose High Strength Concrete Mix. 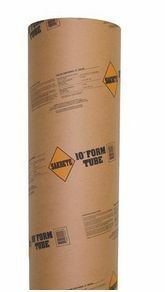 When mixed per the manufacturer’s instructions, this mix affords a compressive strength of 4,000 psi (pounds per square inch) at 28 days. The instructions are: Empty the contents into a mortar box, wheelbarrow, or mechanical mixer. When mixing by hand, form a crater for adding water. Add water a little at a time. Avoid a soupy mix. Excess water reduces strength and durability and can cause cracking. A 60 lb. bag should be mixed with three quarts of water, an 80 lb. bag four quarts. Now the realities of using bagged concrete for post frame building footings…. It is not unusual to have concrete encasements of 24 inches or larger in diameter and 18 inches or more in depth, in order to prevent building settling and uplift issues. One hole this size would take 4.71 cubic feet, or about 700 lbs. of concrete! Even a very small building with 18 inches of diameter and depth takes 2.65 cubic feet or about 400 lbs. of concrete. With either 60 or 80 lb. bags, it is going to take a lot of bags! An average building could easily have 20 posts, and if looking at 700 lbs. 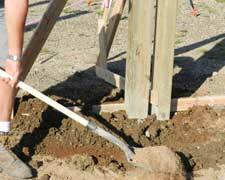 of concrete per post, we are talking about 7 TONS of concrete (3-1/2 yards). Ignoring the huge number of bags involved, there are some other realities. Ever looked at the pallets of readi-mix bags at the lumberyard? Take a peek, next time. Notice how many of them are broken or leaking. Due to weight, it may very well mean another delivery and another delivery charge. Trucks do not run for free. Bags can (and will) break when being handled during delivery, unloading and being moved around the jobsite. It is going to happen, just plan on it. 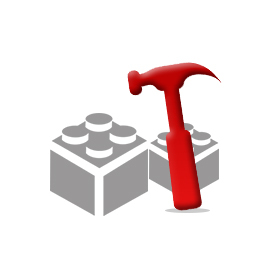 From experience, lots of projects are not begun immediately after delivery. It is not unusual for delays of weeks, or even months before actual construction begins. Improperly stored, bags can get wet or absorb moisture and become solid before time for use. This equals a total waste of money, other than the chunks of concrete make for solid backfill. Then there are the builders who insist upon throwing the entire bag (usually including the bag) into the hole. Their idea is ground water will cause the readi-mix to harden. Why does this not resemble the manufacturer’s instructions? Readi-mix must be mixed thoroughly and evenly. How does mixing over 200- 60 lb. bags of Sackrete® by hand sound? Add too much water (three quarts exactly per 60 lb. sack) and the strength is reduced. Use too much? As holes are always perfectly round (not), it is going to happen. Save time, effort and money. Often all three can be saved by having the local pre-mix concrete company deliver concrete for holes (even if a “short load” fee is charged), as opposed to mixing on site. DEAR POLE BARN GURU: I am building a 36 x 40 pole barn and I’m on a grade that drops approximately 4′ over the span of the building footprint. A home builder friend, a structural engineer, and my concrete guy have recommended traditional foundation with wet set permacolumns, but the builder I’ve contracted with wants to set columns on footers 3′ to 5′ in the ground and not use the permacolumns. The pole barn builder doesn’t think I need a retaining wall and should just have an excavator level what i need with a slope off the back. Seems a retaining wall in the back is better, which my concrete guy will pour, but still recommends foundation to eliminate frost heave. Use for building is car storage and shop with a lift. DEAR CHRIS: This reminds me of a joke I once heard – a home builder friend, a structural engineer and a concrete guy enter a bar……. Oops, kind of off track! Some of the answer is going to depend upon what you want your yard to look like. What might appear to be the least expensive would be to just order columns long enough to get the required embedment depth as shown on the engineered plans, then fill afterwards, sloping away from the building. In order to keep the fill from sloughing off, it will probably result in a slope next to your building which will stretch out as far as 20 feet. You could easily invest in several hundred yards of fill!! If you can live with the look, might be the answer. Building on top of a foundation – this is going to be the most expensive and certainly not the choice I would probably be making. It is also going to be tougher to build upon, due to the height of the walls plus the foundation. Which leaves – build a retaining wall. I like this idea. Columns do not have to be longer (as long as fill is properly compacted). DEAR JOSH: For materials you are going to be looking somewhere in the neighborhood of 53 cents per square foot of roof surface. 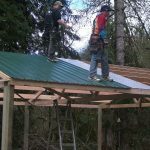 As a builder, if you are anywhere it is typically windy, I am going to give you a decent discount on my labor for having invested in it, because I don’t have to fight rolls of insulation flapping in the breeze. This entry was posted in Insulation, Pole Barn Design, Roofing Materials, Pole Building How To Guides, Concrete, Footings, Building Drainage, Columns and tagged frost heave, Concrete, footings, retaining wall, Mix, compacted pad, drip stop on January 23, 2017 by admin. In typical pole building construction, holes are augured into the earth, columns are placed in the hole so concrete can be placed below the column to act as a footing for vertical support, as well as to encase the lower portion of the column. Above this “bottom collar” compacted soil backfill is used to fill the void between the column and the edges of the holes. Controlled low-strength material (CLSM) is self-compacted, cementitious material primarily used as a structural fill or backfill alternative to compacted soil backfill. It is often referred to by different names including flowable fill, controlled density fill, soil-cement slurry, unshrinkable fill, plastic soil cement and flowable mortar. It is self-leveling, having the approximate consistency of pancake batter, and can be placed in one lift with minimal labor and no vibration or tamping. The American Concrete Institute (ACI) defines CLSM as having a compressive strength less than 1200 psi (pounds per square inch), however most current CLSM applications require unconfined compressive strengths of less than 300 psi. This lower strength is more than comparable with strength of compacted soil backfill. Since CLSM is designed to be fluid, it can be easily placed as backfill in a hole. Soil backfill, even if compacted properly in the required layer thicknesses, cannot achieve the uniformity and density of CLSM. CLSM mixtures typically consist of water, portland cement, fly ash, and fine or course aggregates, or both. Some mixtures contain only water, portland cement, and fly ash. Although the materials used in CLSM may meet ASTM or other standard specifications, it is often not necessary to use standardized materials. The selection of materials for use in CLSM is based on cost, specific CLSM application and the required mixture characteristics including flowability, strength, excavatability and density. The use of fly ash improves the CLSM flowability, and can also increase strength and reduce the mixture’s bleeding, shrinkage and permeability. Air-entraining admixtures are also often used to help improve workability, reduce bleeding, help minimize segregation, reduce the unit weight, and control strength development. This entry was posted in Concrete, Footings and tagged cement, compacted soil backfill, footings on January 15, 2014 by admin.